"All Our Three Stooges Memorabilia Guaranteed Authentic ORIGINALS For Life"
The Three Stooges were a hugely popular film comedy team of the early-1930s until the early 70s when both Moe Howard and Larry Fine passed away in 1975 within months of each other. Today, popularity of The Three Stooges is as intense as ever with collectors paying Unlimited sums of money to acquire the most desirable original, vintage Stooges memorabilia. . The original trio were Moe Howard (born Harry Horwitz, 1897-1975), his brother Curly (born Jerry Horwitz, 1903-1952), and Larry Fine (born Louis Feinberg, 1902-1975). Stooge comedy consisted mainly of slapstick eye-gouging, shin-kicking, head-knocking, and the like. The group made nearly 200 comedy shorts between 1934 and 1958. The first 97 starred the original trio; after Curly suffered a stroke in 1946, he was replaced by his brother Shemp, then by Joe Besser, and finally by 'Curly Joe' De Rita. 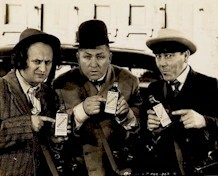 We are endlessly scouring the universe in search of the most rare and desirable Vintage Three Stooges Memorabilia. Let us know what you are looking for and we will find it.